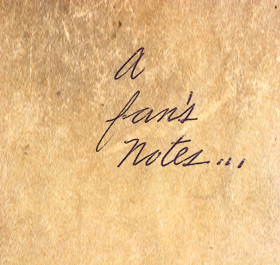 A Fan's Notes: "Love & Mercy"
I don’t recall ever praying that filmmakers would get it right before I heard the news that a movie was going to be made about Brian Wilson’s life. After all, no musician has ever been as important to me as Brian, and I was concerned that the film would be, at best, another mediocre music biopic, and at worst, embarrassing. After all, it’s easy to make sport of Brian’s problems. Just ask the writers at Saturday Night Live who decided that it would be a good idea for Brian to go surfing at one of the lowest moments of his life. I took some solace in the fact that Brian and his family were cooperating on the film. But then came the casting news. Two actors were going to play Brian, Paul Dano and John Cusack. How was that going to work? I can now report that it works brilliantly because the two actors give beautifully nuanced performances. That’s performances, not the imitations that we’ve seen in other biopics. It is an actor’s job to convince the audience to see what he or she wants them to see. To suggest that an actor shouldn’t play a role because he doesn’t look like the real life person he’s portraying, and much was made of that particularly in Cusack’s case, is insulting. If either or both of the actors had missed Brian’s essence, Love & Mercy would not be the success that it is. For the two actor concept to work, both performances had to be spot on. They are, but in very different ways. Cusack’s performance is the best of his career, and he has played several endearing characters over the years. He is a movie star, and there’s always the danger that audiences will see the star and not the character he’s portraying. From the minute Cusack appeared on the screen in Love & Mercy he convinced me that he was Brian Wilson, this despite the fact that he looks nothing like the musician. It’s hard to find fault in Dano’s performance either. Cusack portrays Brian as the wreck he had become by the ’80s. Dano shows us how he got there. Through his performance we watch in horror as Brian crumbles right before our eyes. 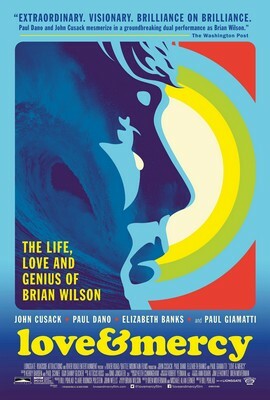 Love & Mercy is something of a valentine to Melinda Ledbetter, depicting her as Brian’s savior as she struggles to free him from the clutches of Eugene Landy. There has been and will be a lot of talk about Cusack and Dano, but the performance of Elizabeth Banks as Melinda is wonderfully sympathetic and compassionate and should be included in the conversation. I’ve never seen her give a better performance. If film is a love letter to Melinda, it’s something of a poison pen letter to Landy, Mike Love, and the fearsome Murry Wilson. Paul Giamatti, Jake Abel, and Bill Camp respectively do a superb job of capturing the ugliness that helped push Brian along on the road to hell. Kudos also must go to Bill Pohlad in only his second film as a director. It is his vision that pushes Love & Mercy to another level. Even great performances can’t elevate a film if the director is content with doing what’s been done before. It’s apparent that Pohlad had no interest in the same old. He’s not afraid to take risks, and with his risks, come visual and stylistic rewards. You can’t talk about a Brian Wilson film without talking about the music. There are scenes in Love & Mercy that depict that recording of Pet Sounds at United Western Recorders (known then as Western Studio, now as EastWest Studio) in Hollywood. We see Brian working with Wrecking Crew stalwarts like drummer Hal Blaine (who turns out to be something of a hero in the film, lending encouragement to Brian in a moment of deep insecurity), and bassist Carol Kaye. These scenes are thrilling to watch for anyone who is intrigued by Brian’s recording process, and the fact that they were filmed in the same studio that the original recording took place only makes them more special. Love & Mercy confirms the widely held view that Pet Sounds was Brian’s masterpiece. At the same time it confirms that SMiLE is something of a miracle. Brian was terribly tormented while trying to make SMiLE, by his own demons, and by his cousin Mike’s withering criticism. The fact that any work on the album survived at all is a surprise. The fact that the work that remained unfinished for 38 years and then turned out to be transcendent is, as I said, a miracle unprecedented in my music listening life. It is no spoiler to tell you that Brian wins in the end. Brian and Melinda got married and remain married to this day. SMiLE was finally finished and Brian released his album of the work in 2004. It won two Grammy awards, and when Brian played it live for the first time in London, it was a triumph. This year Brian put out a great new album, No Pier Pressure, and he’s going on tour in a couple of weeks. And Eugene Landy lost his license to practice psychology and was exposed as a charlatan. So Brian wins, but at what cost? His two younger brothers and both of his parents are gone. He is divorced from his first wife, Marilyn. Despite substantial improvement in his condition, Brian remains a fragile person, but one with millions of fans around the world who want nothing more than to protect him from further harm. Love & Mercy is likely to bring many new fans into the tent and that alone is a great achievement for this powerful, emotional film. Don’t miss it. And speaking of things that should not be missed, please read my colleague Robert Cashill’s great review of Love & Mercy here.